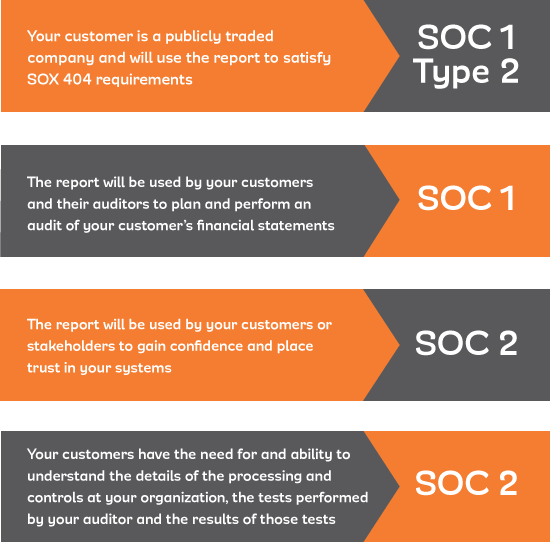 WHAT IS A SOC 1 REPORT, AND WHY DO I NEED ONE? A System and Organization Controls or SOC 1 report is a formal audit of a service provider’s controls that affects their client’s internal control over financial reporting. SOC 1 reports, formerly known as SAS 70 and SSAE 16 reports, are specifically intended to meet the requirements of the entities that use service organizations and those entities’ financial statement auditors. By obtaining a SOC 1 attestation report that is performed by a third-party CPA firm, not only are you providing an increased level of confidence to your clients but also adding significant value to your service organization. A successful SOC 1 audit will differentiate your organization from your competitors by demonstrating the establishment of an effective control environment and a commitment to the security of your client’s data and confidential information. As of May 1, 2017, the SOC 1 / SSAE 18 standard replaced the SOC 1 / SSAE 16. Most requirements remained the same, however, there are some important changes to consider. These changes include maintaining a formal Vendor Management Program, performing periodic Risk Assessments and placing greater emphasis on the monitoring of Subservice Organizations. The determining factor when choosing between a SOC 1 and SOC 2 report is whether your organization’s controls are relevant to and have an impact on your client’s internal control over financial reporting. If the answer is yes, then you need a SOC 1 instead of a SOC 2 report. FOR ASSISTANCE WITH A SOC 1 REPORT, PLEASE COMPLETE THE CONTACT FORM BELOW OR SEND US AN EMAIL AND ONE OF OUR SUBJECT MATTER EXPERTS WILL RESPOND TO YOU SHORTLY.